The Goðafoss waterfall is located in the Mývatn district of North-Central Iceland. The water of the river Skjálfandafljót falls from a height of 12 meters over a width of 30 meters. In the year 999 or 1000 the Lawspeaker Þorgeir Ljósvetningagoði made Christianity the official religion of Iceland. 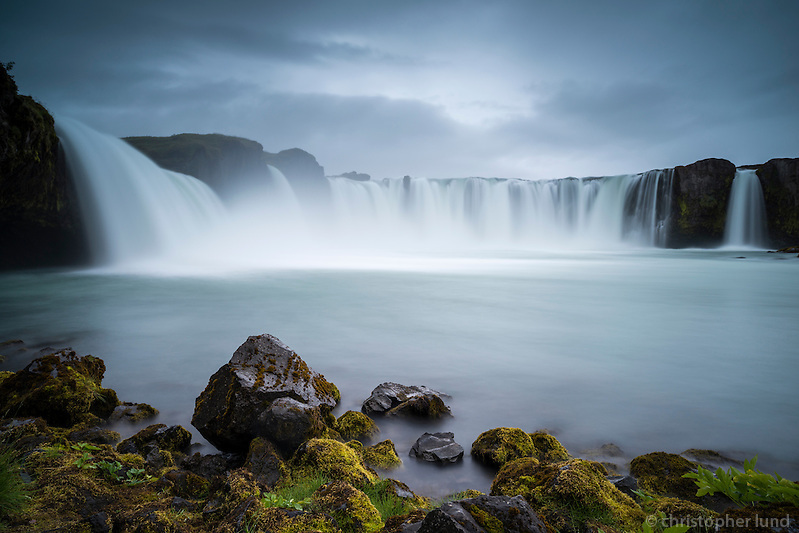 After his conversion it is said that upon returning from the Alþingi, Þorgeir threw his statues of the Norse gods into the waterfall to prove that he was indeed giving up his pagan religion. Þorgeir’s story is preserved in Ari Þorgilsson’s Íslendingabók. Posted on Thursday, March 13th, 2014 at 18:52. Filed under: Locations, North Iceland Tags: goðafoss, iceland, landscape photo workshop, north iceland, photo tours, snow, waterfall, winter	RSS 2.0 feed.